Hooray!! Spring has sprung and Mother Nature is calling us outside to play in the gard en. It’s time to clean things up in the yard and watch things bloom and grow. I always feel excited to get out there and see what new little plant has popped its head up. It feeds my soul to get my hands in the dirt and nurture the brave little things along. I know for myself, after a period of raking, trimming, digging and pulling weeds, my feet, hands, legs and back always remind me that I’ve done something out of the ordinary, especially in the Spring, from using a few muscle groups that don’t get worked in my normal Pilates and resistance workouts. I can’t tell you how many clients I’ve seen that come crawling into the studio after a weekend of gardening complaining that their back hurts! 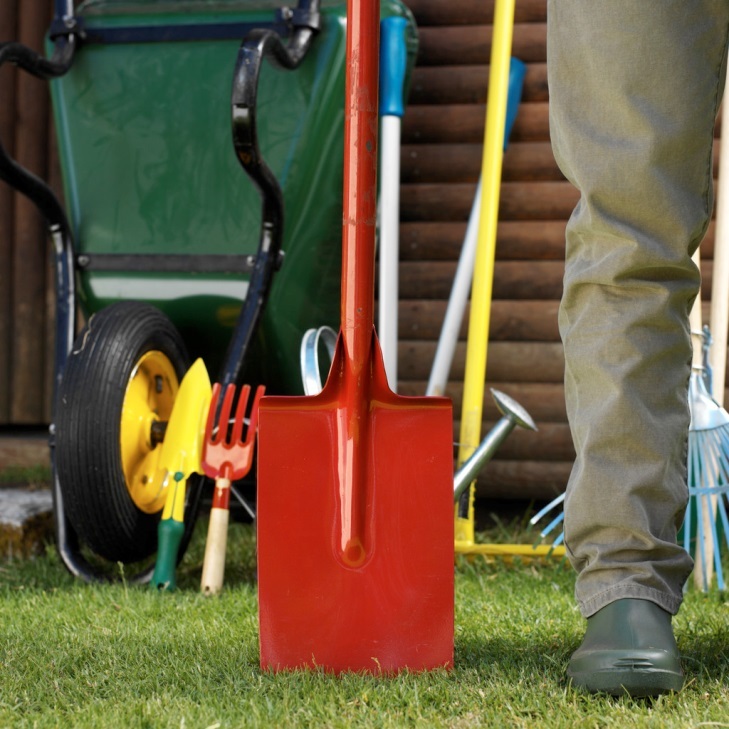 And while I can’t promise that you’ll be able to totally avoid muscle or joint soreness when gardening season starts, there are some things you can be mindful of to help keep your body well-balanced while you’re digging, chopping, raking and having fun “green thumb” experiences. Pilates is the perfect off-season gardening training program! We do exercises while standing, seated, kneeling, face up, upside down. We focus on spine, hip and shoulder mechanics, core support, and so many things to help you become well-balanced and aware of how you are moving. So how do we stay healthy and avoid knee, hip and back pain while having fun working in the yard and gardening? Here are my top five Pilates tips to help you stay pain and injury-free this season. Use Your Core MORE. That strong low abdominal support we work on in Pilates is critical when you’re bent over and working in the yard. Not only does your deep powerhouse need to work as you’re digging pulling, and lifting, but they need to stay engaged the whole time you’re bent over to support your lower back! Check in on your shoulders… if you find you are hiking your shoulders up, it could be your abs are not doing their job. Ab strength rocks! Coordinate Your Breath with Your Effort. You will have maximum core support when you exert on an exhale. Even if that little weed you might be pulling is small, it may be tenacious. So inhale to prepare, exhale (pull your abs in, melt your shoulders down) and then pull on the weed! Develop a Pilates-style breathing pattern that supports your efforts, whether you’re pulling weeds, digging, pruning, everything you’re doing and you’ll be amazed at the difference. Alternate the Leg You Squat Down With. We habitually tend to put our dominant leg forward. If you do this while you are gardening, there’s a good chance you’ll be doing tons of full squats on one leg and zero full squats on the other side. This will overdevelop your strong side, and continue to weaken your weak side, shifting your hips, pelvis, and back out of alignment. Alternate legs when getting to the ground and when getting up. That way you’ll work both legs evenly and you’ll find your body feels better when you’re done. Think balance! Alternate the Hand You Use To Do the Work. Again, balanced muscle development. 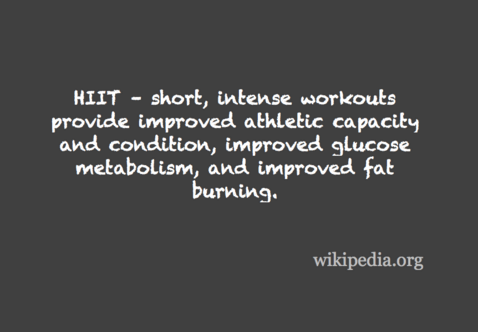 It’s important to think about strength training to develop both sides of your body evenly. It’s a challenge to use your weaker hand, arm and shoulder to pull weeds and plant. Can you do it? Squat down with your left leg and pull weeds with your right hand. Squat down with your right leg and pull weeds with your left hand. It can be as much of a brain-game as a whole-body workout to be consciously working the body evenly while you’re digging in the dirt! Gardening can be a fun way to put your Pilates body into action and apply everything you know about moving efficiently. Incorporate these 5 Pilates training tips to help avoid knee, hip, and back pain while gardening and discover how valuable your Pilates training really is to keep you strong, fit, and flexible. Enjoy every minute of your time your nurturing green spaces AND still be able to leap out of bed the next day with a healthy body and happy back! 1 ½ cups shredded part skim mozzarella or swiss cheese. ¨Spray a large roasting pan with non stick spray. Add mushrooms, zucchini, bell peppers, onion, olive oil, vinegar, garlic, rosemary, and oregano. Mix well, until vegetables are coated with seasonings. Roast, uncovered, at 400 degrees for 25 minutes, stirring once halfway through cooking time. ¨While vegetables are roasting , prepare cheese filling and cook pasta. In a medium bowl, combine ricotta and cottage cheese and egg white. Mix well. Refrigerate until ready to use. Prepare lasagna noodles according to package directions. Drain well. Rinse with cold water and drain again. ¨To assemble lasagna, spray a 9 X 13 inch baking dish with non stick spray. Spread ¼ spagetti sauce over bottom of pan. Arrange 4 lasagna noodles, 3 lengthwise and one crosswise, over the sauce. Spread ½ cheese filling over noodles, followed by 1/3 roasted vegetables. Sprinkle vegetables with 1/3 mozzarella. 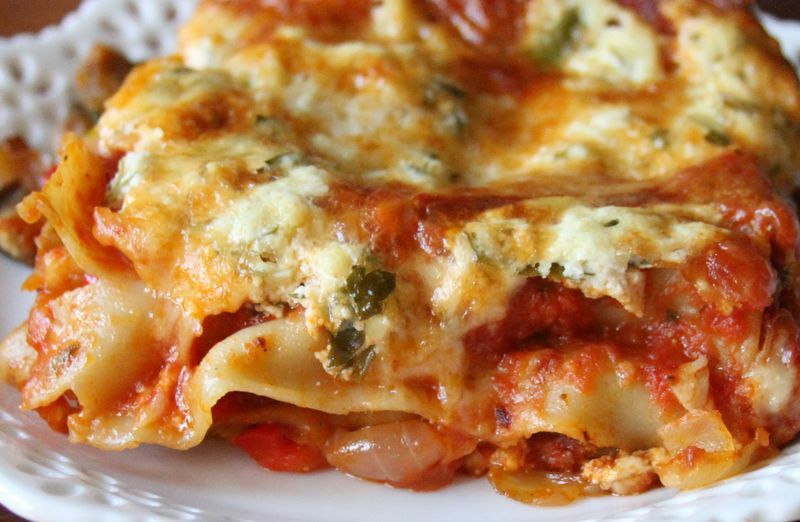 Repeat laying: 4 noodles, ½ cheese filling, 1/3 roasted vegetables and 1/3 mozzarella. Layer final 4 noodles over mozzarella, followed by remaining spagetti sauce. Top sauce with remaining roasted vegetables. ¨Cover with foil and bake at 375 degrees for 35 minutes. Remove lasagna from oven, sprinkle with remaining mozzarella and parsley and return to oven uncovered, for 5 more minutes. Let cool for 10 minutes before serving. Today’s education piece is “20 truths about life you didn’t learn in school!” from Mind Body Green. Just think if we had known this stuff back then would it have changed the paths our lives have taken? Life is so much about experiences and our perception of those experiences! I know my own life’s journey has taken many twists and turns along the way and as I reflect back on some of the struggles and successes in my life, I know that I am the person I am today because of those experiences. I live a “no regrets life” and I know that on my death bed I won’t say “I wish I had done this or that”. 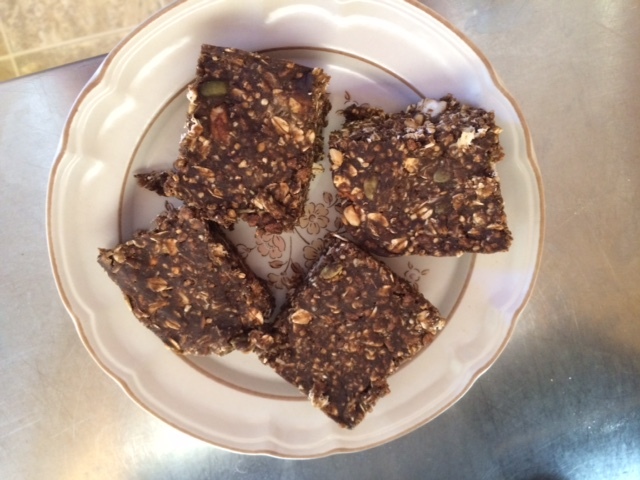 Mix all together and press into a 9×9 pan, cut into 12 bars, store in fridge or freezer. Nutrition Information per bar: 250kcal, 8.6g Fat 2.1g Saturated,30g Carbohydrates, 16g Protein, 14g Sugar,6.6g Fiber. This original recipe was shared by Judie Martin and revamped to reduce the calories and fat. You may have noticed that we have been featuring recipes with chickpeas over the last couple of weeks. I love chickpeas because of their versatility and appreciate their ability to keep my on a more “even keel” throughout the day. Click here to find out why this is the case and view some other tasty recipes from Canadian Living. 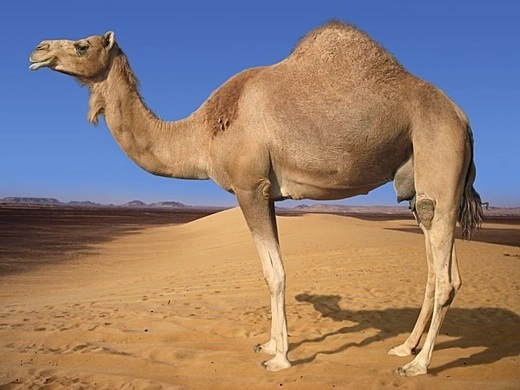 Blog of the Week: What the heck is Hump Day? What the heck is Hump Day? OK…I know it is Wednesday but what does Hump Day really mean and why should we care? And, more importantly, how does it relate to what we do here at Balanced Motion Pilates and Yoga? Of course, when I am not really sure what the answer is, I do what many of you do and that is I “google” it . As an aside, my son would be horrified if he read this as apparently “it sounds weird when mothers say, “google” and really people don’t say that anymore..who knew?? Back to Hump Day. Many of the answers that I came across talked about slogging through Monday and Tuesday to finally get to Wednesday, rejoicing on the top of the hill on Wednesday ( picture doing a happy dance, blowing a big horn etc.) and then doing a tuck and roll in to the weekend totally exhausted. All of this being said, I would like to challenge you to think about your week in a different way. You come in to your week feeling renewed and refreshed from time well spent on the weekend ( maybe a little extra sleep, some renewing social time, a yoga class, a visit to the Farmer’s Market, golfing, some outside time, whatever fills you up on the weekend, even if it is for one day). You come in to Monday and Tuesday feeling refreshed and revitalized. Here is the kicker, you maintain this vitality by sticking to a routine each day that includes water, movement, nutrient dense food, breath, thankfulness, laughter and BLEB ( Being Less Easily Bothered) by every day annoying occurrences ( my personal favourite). In this way, when we get to Wednesday, we have the energy to not only finish the climb to the top of the hill, but we sprint down the other side into Thursday and Friday with energy to spare for an amazing weekend. It just makes for a more BALANCED week which is what we are all about here at Balanced Motion. Enjoy your Hump Day (with energy to spare) and the Sunshine! 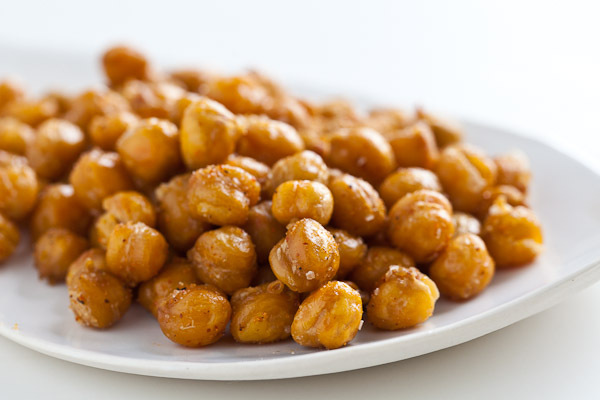 Toss chickpeas with oil and seasoning. Spread in single layer on baking pan. Bake in 450F oven for 30 minutes, shaking pan every 10 minutes. OK so spring melt has been a bit slow and erratic this year … but if you are like me, its so exciting to get outside on these warmer days. A few weeks ago we featured a link for walking tips in slippery conditions. So far this spring has proven to be very icy underfoot. So to add to your confidence for how to prevent falls while outside, here is a link to an article written by Margot McKinnon, educator extraordinaire and founder of Body Harmonics in Toronto. Happy Friday… here’s hoping for lots of safe outside time this weekend. On days where the sidewalks are slippery, core connection really helps us keep our balance if we come across a patch of ice. Here are some exercises to help you build strength for feet, ankles, inner thighs and core. As the summer season approaches, these exercises translate beautifully into keeping our balance while paddle boarding as well. Click here to watch this weeks exercise Vlog. Hope you enjoy!